GVS Cleaning provides a full range of commercial cleaning services operating throughout Northumberland and Newcastle Upon Tyne. Our fully trained, uniformed, DBS checked cleaners work in pairs and specialise in commercial cleaning for small to medium businesses. From offices to retail units - no job too big or too small. We can clean your business as and when to suit you, and provide all cleaning materials and equipment. Are your carpets and upholstering bringing your company down? Do they have unwanted smells or unsightly stains? We offer three different types of carpet and upholstery cleaning to suit varying levels of requirements. 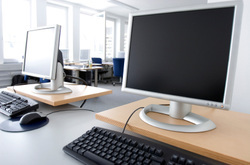 We offer daily, weekly or fortnightly office cleaning, tailored to suit your businesses needs. Our cleaners will develop a comprehensive cleaning schedule with you and then ensure this is delivered every time, ensuring your premises are ready for your daily routine. We supply end of tenancy cleaning to letting agents, private landlords and tenants. Our fully trained, professional cleaners can undertake the full property clean, including carpet and upholstery cleaning and oven cleaning, to ensure each property is thoroughly cleaned and ready for the next letting. A professional, reliable cleaning company is a valuable asset in supporting any landlord or letting agent. For a tenant moving out, our cleaners will ensure you pass any landlord inspection and in return, not lose your deposit. First impressions are everything, and when your guests enter their holiday home you want them to be impressed with the level of cleanliness in which the property is maintained. Our holiday cottage cleaners ensure your property is thoroughly cleaned, ready for your next guests. We offer a full range of services from the changeover clean to housekeeping, laundry and more. No matter how many holiday properties you have, GVS Cleaning can develop a cleaning plan for you. Our cleaners support workplaces to ensure shared communal areas, such as entrance ways, washrooms, kitchens, lifts and stairways clean and presentable for employees, visitors and/or residents. We provide cleaning services to construction companies, private developers and builders to keep sites clean and safe. Whether you require cleaning support throughout your building project, or to make properties clean and presentable for handover, we can help. Looking for a Commericial Cleaner in Northumberland? Contact us for a no obligation quote and to discuss what we can do for you.